Roses are one of the most popular and commonly grown flowers. Since 2004, when the Knockout® rose was introduced they have become so common in the United States that I’d bet you’d be hard pressed to go a day without seeing a rose bush somewhere. Even my local McDonald’s (hardly a mecca for fine gardening) has rose bushes along its drive-thru line. Easy Care Roses – I Promise! 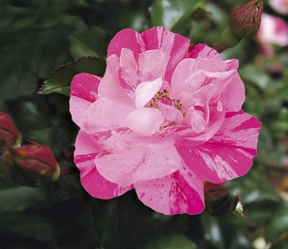 This Flower Carpet ‘Pink Splash’ is one of a new line of ground cover roses. being out in their garden every weekend caring for finicky plants. Breeders got the message loud and clear and are introducing plants to meet that need. 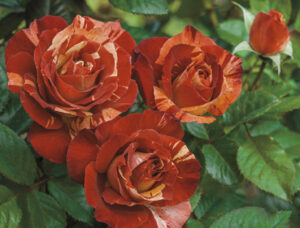 Tesselaar has recently introduced a lovely family of no-care roses called Flower Carpet. These are very low-growing roses, so low they are advertised as ground cover roses. I have planted several of the ‘Pink Splash’ varieties along a rather bare wall at my home. Since it is planted in a place I don’t want to do much gardening these roses should be just the thing for this spot. ‘Watercolors Home Run’ is a self-cleaning, disease resistant shrub rose. Another easy care rose just introduced is ‘Watercolors Home Run’ from Weeks Roses. This rose reminds me a little of ‘Joseph’s Coat,’ a multicolored heirloom rose. ‘Watercolors Home Run’ is a shrub rose that forms a well-behaved mound of color throughout the growing season. 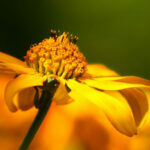 It is said to be disease resistant. Because it is a sterile hybrid, it needs no pruning to remove the spent flower heads. This rose would be a good candidate for homeowners that want color without any fuss. How About a Living Fence? Tropical Lightning’ is a deep red-orange climbing rose with splashes of cream to pink. Roses can do more than provide color in the landscape. Some varieties are climbing roses that can be used as a lovely, dense barrier shrub. Climbers can also be used to create an arching entrance to your garden. 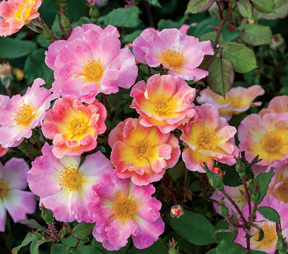 If this sounds good for your garden, consider ‘Tropical Lightning’ also from Weeks Roses that features “exotic-colored blooms that mix sunset orange and smoky purple—accented with cream-colored stripes.” This climbing rose produces canes 10-12 feet long so plant it where it will have plenty of room to spread out. To ensure a healthy rose bush, give it the equivalent of one inch of rainfall per week during the growing season. Water at the soil level to avoid getting the foliage wet, because wet leaves can encourage diseases such as black spot and downy mildew. Fertilize 2-3 times a year to encourage healthy growth. Ann, a month ago I ordered a “Disneyland’ bare root rose from Jackson and Perkins. It came about three weeks ago. I prepared the hole for my new rose. I’ve watered, fertilized and mulched. So far, no new sprouts or ‘eyes’. How long should I wait to begin to see growth? The rose is in a south facing location with east exposure and shade from the west in the later afternoon. We’ve had some unusual weather this spring in Idaho. Not sure if I should pull rose out and try another location or keep waiting? Terry, if you haven’t seen any signs of life by now I’m afraid your rose is dead. If you still have the receipt I suggest contacting Jackson & Perkins to see if you can get a replacement. I love the 3 roses in your article. Where can I find them. Carpet, Tropical Lightning, and Watercolor Homerun. I just built a new home and am designing my back yard. I have a 50 foot bed set up for roses that I brought in good soil to plant in. I live near Austin, Texas. So it’s hot, hot, hot. Thanks. Sharon, unfortunately we have moved into the hot part of the summer and nurseries are not ordering new stock. When I went to buy another Flower Carpet rose in early June, my nearby nursery had them discounted so they could clear out the remaining stock. Once Labor Day comes, you may see some of these roses reappear. The most likely source at that time would be the online grower’s website.